Greetings everyone, thanks for tuning into this week’s Green Tip Tuesday! The weather is surely changing for the better and the leaves up here keep getting brighter and louder. On that note, those leaves will be falling any week now so we’re going to get a head start on them and have one of the most epic Powe. Mountain Projects this weekend, October 14th, 1:00 pm @BoltonValley and sponsored by Switchback Brewing Co (@switchbackbeer)! That’s right folks, come help clean up for a bit and get a free beer from Vermont’s finest craft brew. Oh yeah and PIZZAAAAAA, no excuses now, see ya there! Alrighty Folks, this week we’re getting radical and most definitely tubular so get ready to hang ten and experience copious amounts of gnar. Pull the strings tight on those swim trunks cause we’re paddling out to the swells of Tubular Daylight Devices, or, TDD. A TTD is a system of reflective cylinders and pipes that spread natural daylight into homes via a clear plastic dome located outside your home. 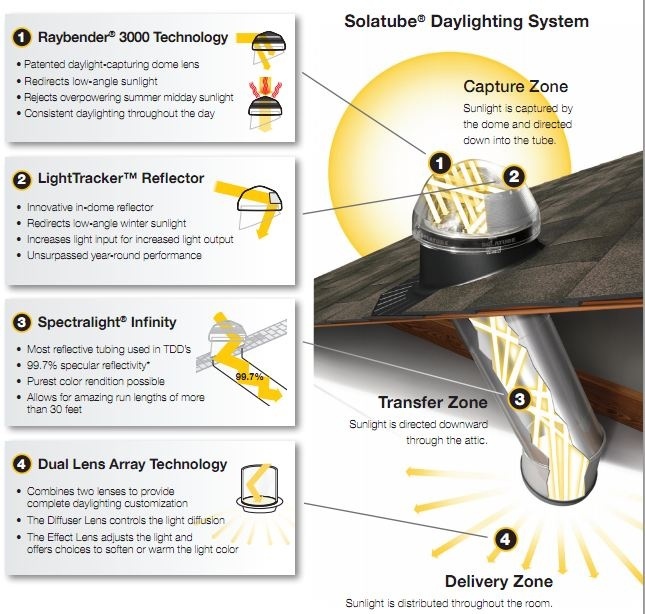 The reflective pipes and cylinders are installed in between the ceiling and roofs of houses and are purposed to replace or aid pre-existing lights. These tubing systems are so efficient that pipes can run more than 50ft long and have light waves withstand right angles while only losing .3% of it’s energy per bounce. Having a system like this in a home can allow natural light to be delivered to rooms and spaces that may not otherwise have that opportunity. The lens of the pipes where light passes through into your room is a bit glazed which helps diffuse the light into the room instead of creating a beam or hotspot of light. This actually illuminates your room more efficiently than an electric light bulbs/fixtures and is much better for your eyeballs! Did you know that using enough of these fixtures in one room can actually help heat the room as well? Probably not, but now you do, you’re welcome. So let’s recap what we’ve just learned in that last 45 seconds. With TDD’s you can reduce the use of your electricity usage (and bill), create an atmosphere brightened with natural light, save your eyeballs, naturally heat your house more, aaannnnnnddd cut that bill down too. Hmm, this seems like a no brainer to me. That’s it for this week gang, thanks for reading in and helpin’ out Mah Earth just a little bit more! Don’t forget, Bolton Valley, Switchback Beer, Powe. Snowboards, this Saturday, October 14th, 1 pm, LET’S KEEP THAT MOUNTAIN CLEAN!